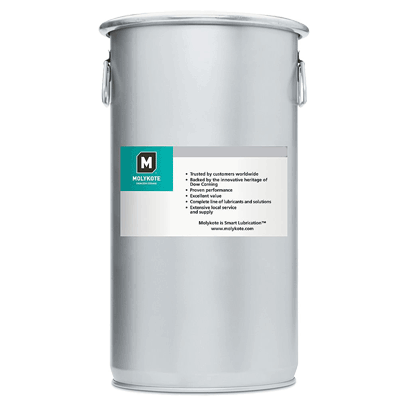 Molykote Foodsafe food grade L-0460FG chain lubricant helps prevent wear and process interruptions in power transmission systems and components. Compared to conventional oils, it also offers greater resistance to oxidation and stable performance at high temperatures and under high loads. Molykote chain oils maximise fill intervals and maintain viscosity characteristics at wide temperature ranges. Click here for a Case History Study on how Molykote Foodsafe L-0460FG proved it's worth in a food plant. A meat processing plant was using a mineral oil product to lubricate its drag chains. The chains were experiencing a high degree of rust and wear due to the frequent washings that were required. Conventional oils don't work well because they have a tackifier additive which causes the oil to thicken and prevents the flow of oil to all internal components. The company switched to Molykote L-11460FG. Click here for the Molykote Foodsafe Brochure. The Molykote® fluids conform to requirements under H-1 or H-2 designations of the U.S. Department of Agriculture (USDA), many are kosher approved and have Ag Canada approvals. The H-1 designation means that the lubricated part may have incidental food contact not to exceed 10 parts per million. The H-2 designation means that the lubricated part may not have contact with food. These fluids are a smart choice for lubrication in environments needing constant wash downs due to their resistance to emulsification with water. In addition, to meet the dramatic temperature variations from freezers to ovens, the product line includes H1 lubricants with operating temperature capabilities from -60°C to 150°C (-76°F to 302°F), and H2 lubricants with temperature capabilities from - 60°C to 250°C (-76°F to 482°F). The product line also includes compounds, greases, pastes, anti-friction coatings and dispersions with temperature capabilities from - 226°C to 1400°C (-375°F to 2550°F).